I’m writing fewer and fewer parenting posts these days. Which is interesting, considering that each day that passes gives me more experience as a parent. But it also reveals how little I know when it comes to raising these children that God has given us. I used to think I knew a lot about being a mother. In the early years, most decisions were clear-cut. It’s fairly straightforward to discipline my child when she’s directly disobeying me, lying, or being mean to her sister. Yet the older they get, the more that changes. I see parenting as less and less formulaic. Our approach depends more on the personality of that child, as well as their maturity level, and their history of making (or not making) wise decisions. 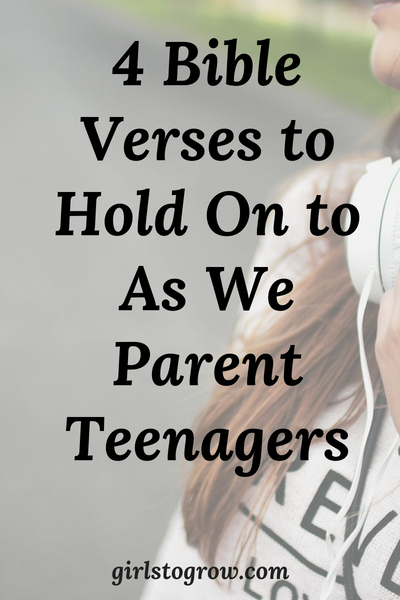 It’s become less and less about parenting through authority, and a lot more about exercising influence. Each year that passes has us releasing a little more control to them to make their own decisions. All that to say that more than ever, I need guidance from God’s Word. The four Bible verses below are a foundation I know I need to return to again and again when I’m unsure of what to do. They apply no matter what stage of parenting we’re in, but have certainly become even more treasured as my girls get older. I need this verse every. single. day. I took part of this verse and made it the pass code for my smart phone. That way, every time I put it in, I’ll remember to pray for wisdom! This verse is a promise. I simply have to recognize that I lack wisdom (not a problem!) Then I ask in faith, believing that God will give me wisdom, and He will. My husband and I have both experienced times when we were dealing with one of our daughters, and God gave us insight in that moment that we hadn’t had before! When it comes to parenting situations, I don’t always feel like I’m coming boldly…it’s more like crawling up to God’s throne begging for help! But that’s the place we need to be if we want to find the grace we need to get us through the hard days. This also reminds me of the daily grace God provides to us, even when we sin yet again. In that same way, I need to extend grace to my daughter when she messes up…and she will. I don’t live perfectly, so why do I expect her to do so? While our children’s actions will produce consequences, it’s not wise to hold them over their heads or continually bring them up. We deal with it, we move on, and give grace. Paul was persuaded that nothing could separate him from God’s love. The same is true of me, and of my children. No matter how they’re acting today (that’s driving me crazy) or the poor decision they made that I’m having to deal with, God still loves them. And when, as parents, we lose our temper or miss an opportunity to invest in our children, God’s love for us is still there. It’s constant and comforting. There may be a day when we experience disappointed hopes and dreams. Our children’s lives may not be playing out in the way we’d hoped. Our relationship with them may look different from what we’d mapped out in our minds when our children were little. But God thinks about our children. He has thoughts about them, and plans for their future. Each part of their story can be used for His glory…as can ours. How thankful I am for God’s Word that gives us hope and comfort for every situation we face! Great insights, Tracy. Even though I do not have children, I still have a home and situations that need this kind of Godly surrender and dependence. Thank you for sharing these! You are right – these verses could apply to many relationships we’re involved in and situations we face in our lives! I pray the James verse almost daily! I like to say that, after having four children, I thought I knew a thing or two about having children. Then God gave me Hannah. Now I know how much I don’t know! Another verse I keep in mind is that Romans 8:28, how God uses everything for the good of those who love Him and are called according to His purposes. Romans 8:28 could definitely be added to this list! Even my parenting “fails” can be redeemed by His grace, and what a comfort to know that God is working all together for good in my children’s lives (as well as mine) as they’re seeking to follow Him. Great verses! I don’t think parenting gets easier and I don’t think we ever know enough. Thanks! No, I’m certain I’ll continue learning how best to parent for the rest of my life 🙂 Thanks for taking the time to comment! Smart phone passcode = brilliant!!! Things like that really help keep me in the word! I need as many little “tricks” like this as possible to remind me of Bible principles and promises! !